Carter of the Month | CUSTOM DOG CARTS | Manufacturing and selling the finest dog carts for draft dog competition and recreation. Boone is a rescue originally found in Georgia and transplanted to Florida. He is smart and talented and has beautiful black and grey coloring. In the year he has been with his owner they embarked on a training and fun schedule which includes tricks training. His owner hopes that he will soon complete the requirements to qualify for the AKC Tricks Performer (TKP) title. Boone is also enrolled in Rally and Obedience classes and will be competing in Novice classes for both. 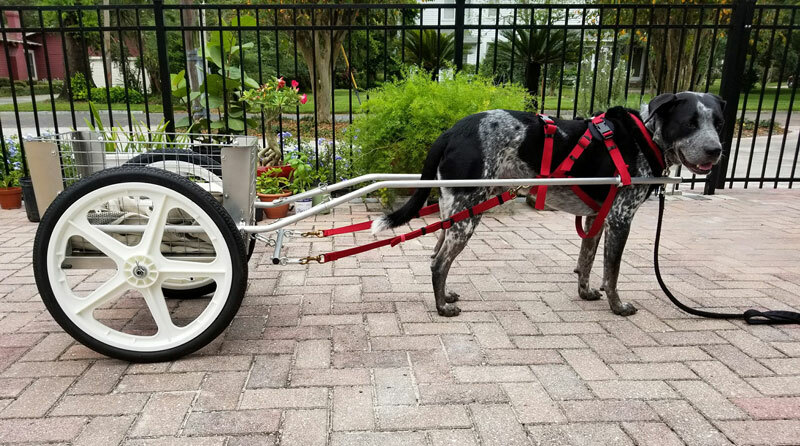 His owner purchased one of our Custom Dog Cart and Boone recently entertained the neighborhood by hauling pumpkins in his cart en-route to his house. Boone is a star, no doubt about it. We are pleased that his owner chose a Custom Dog Cart for him.